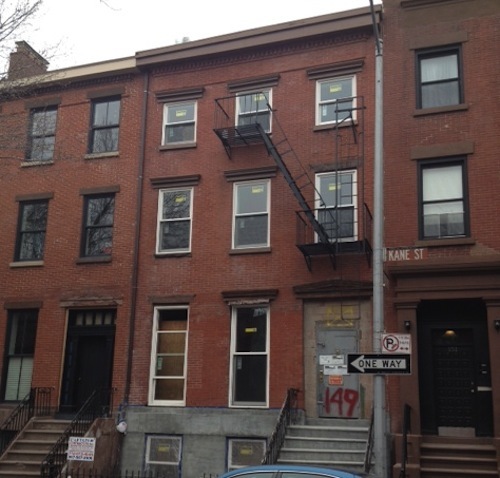 If been more than five years since I spotted, and blogged about, what I thought was a rat (and turned out to be a squirrel) lounging on the upper windowsill of the tumbledown mess that was the landmarked Cobble Hill building at 149 Kane Street. After many a drama, and a few media circuses, the building's on the road to better health. But, to my amusement and, I must admit, delight, the rapidly improving brick house is still referred to as the Rat-Squirrel House. At a certain point, are we going to stop referring to this place as "Rat Squirrel House"? Probably not. I almost feel bad for the person who eventually pays a gazillion dollars for this house and everyone still points to it and declares: "Can you believe so-and-so paid that much for the Rat Squirrel House?" Of course, Grey Gardens was just as bad and no one calls it the "Crazy Cat Pee Raccoon House," today. Too bad Jackie O. didn't have another crazy cousin or aunt in Cobble Hill. This made me smile. However, since I do not feel bad for people who spend a "gazillion dollars" on houses in Brownstone Brooklyn and drive up housing prices, making it harder for folks like me to live in this City, I say: tough. It's Rat-Squirrel House and it will stay Rat-Squirrel House. Anyway, it's famous as such. The new owners should be proud they own such a landmark! I was walking down Smith Street past the Red Rose restaurant, the old red-sauce joint for forty years standing, when a photograph in the window caught my eye. I'd never seen it before. It was a black-and-photo of the eatery from the '70s. The sign and and storefront were different back then. And there was a vertical "Pizza" above the restaurant, betraying the joint's now-forgotten heritage as a pizza place. But that's not what interested me. 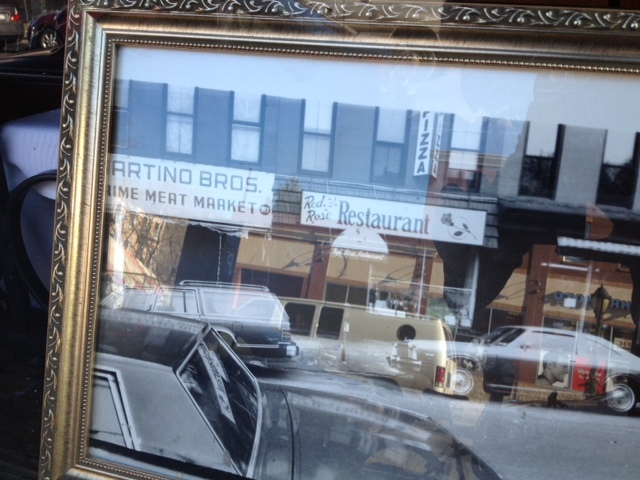 I noticed the business to the north of the Red Rose, Martino Bros. Prime Meat Market. 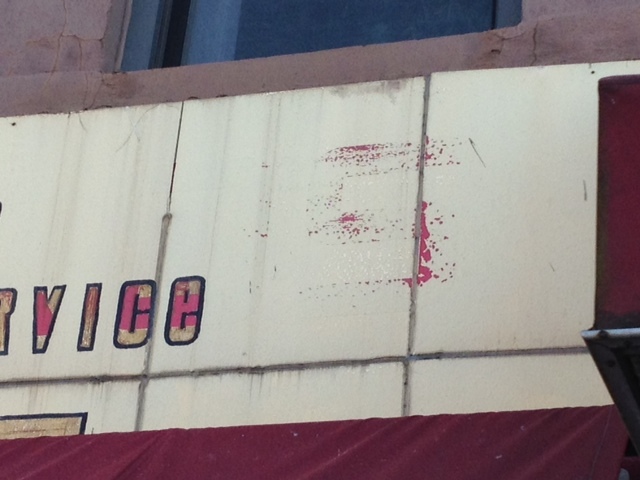 Long gone, of course, but the pale, metal sign looked oddly familiar. So I walked about ten feet down the street and took a good look at the laundromat that had taken the place of Martino Bros. The sign was big, pale yellow and metal. Could it be it was the same damn sign the butcher had used? I looked more closely. Sure enough. 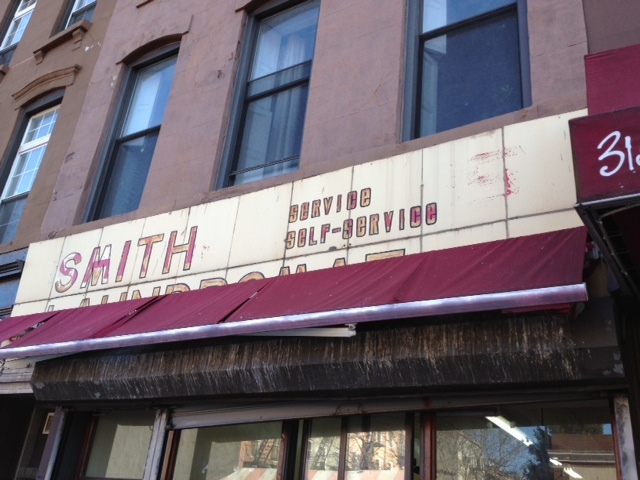 The owners of Smith Laundromat has just painted over the Martino Bros' letter and painted on their own name. Only they hadn't done so fantastic a job, so you can still see the outlines of some of the Martino letters, like "S," seen above. The once infamous Rat-Squirrel House of Cobble Hill is close to looking like a structural citizen. The plywood that has covered the windows for a couple years has been replace by actual windows—sure the first set of new windows that once-scandalous building has received since it was built more than a century ago. Now it just needs a new door and a paint job on the first level, and its like its former life as a squatter's, trash-strewn haunted house never happened. Lost City Asks, "Who Goes to El Charro?" I had a moment of déjà vu as I walked down the few steps into the restaurant tucked into 4 Charles St. Quiet Village street; basement space; tiny room; low ceilings; small bar to the left. Was I in Fedora? The real Fedora, I mean, not the impostor currently sailing under that name on West 4th Street. Of course, I wasn't Fedora has gone the way of other fine New York institutions who have discovered the hard way that the brutal economics of 21st-century New York have no place for them. But El Charro Español is that kind of place. It's what pops into your mind when you picture the typical, side-street Greenwich Village eatery of old: cozy, slightly hidden, tradition-bound, attentive to its regulars, and offering the diner not a raucous jolt of energy but a relaxing respite from the world. El Charro's exact age is hard to determine, but it's probably been here for about 60 years, gathering minimal press attention, but a faithful clientele that it made almost entirely of locals. This is a neighborhood joint. It began as a Mexican restaurant, a culinary rarity in those post-WWII days. It was run by Maria Garcia. (Her daughter married Carlos Jacott, who went on to found El Parador on East 34th Street, which still stands and is today the city's oldest Mexican restaurant.) El Charro remained a Mexican place at least into the '80s, but today, under its current owners, it is a Spanish restaurant, and a good one.I ordered a sangria when I saw that the bartender was mixing them separately, constructing each in the glass, rather than pouring the potion out of a pitcher. The Shrimp Ajillo, sauteed in olive oil, garlic and hot pepper, was beautifully done: simple, tender and subtly spicy. For my entree (which came with one of those comforting—but not necessarily good — side salads slathered in French dressing) I had Pollo Villaroy, two breasts of chicken coated with bechamel sauce and bread crumbs and deep fried. It was tasty, but perhaps too filling. Though I liked it, I could have done with a half order. The ratio of staff to patron was about one to two the night I was there. So it's no surprise that service was attentive. Or maybe I should not take that for granted. I've been in plenty of contemporary restaurants stuffed with waiters and still had a hard time getting anyone's attention. Old friends were catching up at one table, a mother and a daughter at a second. Making the most noise were two men having a convivial business meeting, the larger, older one a longtime regular feeling very at home, the younger, thinner one a newcomer who seemed to want to be in a steak house. He ordered a filet mignon ("Can you butterfly that?") and called out for A-1 Sauce. "Are you complaining about this place?" his hefty friend asked in comic disbelief. "Are you COMPLAINING about this place." I was sympathetic. I mean, seriously, dude, are you complaining about this place? Labels: El Charro, El Parador, fedora, greenwich village, who goes there? A sharp-eyed reader sent me a photo of this old wooden phone booth, spotted inside 473 Third Avenue, at 10th Street, in Brooklyn. 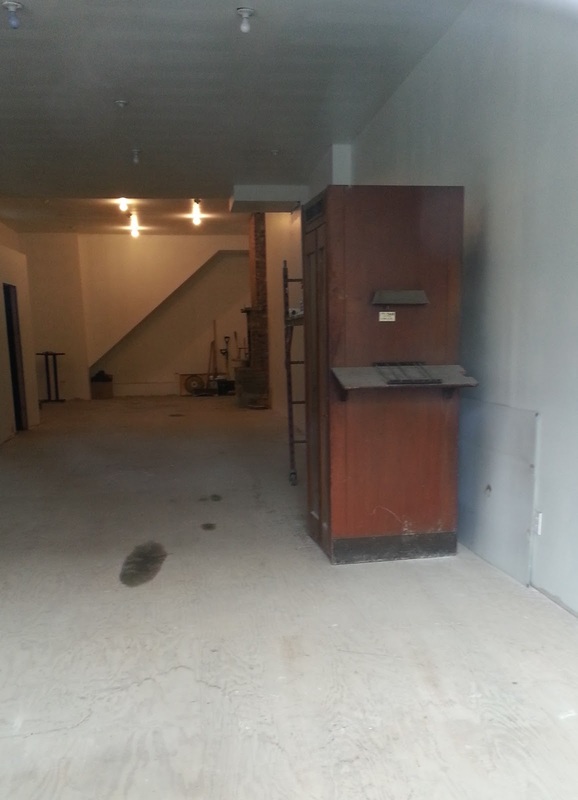 The space is under construction, but the new owners seem to have retained the phone booth from the address' previous incarnation. According to old newspaper records, this was the location of the Third Avenue Pub & Restaurant, at least until 1973. And it was a store of some sort going back to 1900. The property was purchased by someone last December. Plans unknown. Note the intact shelf on the side, used for perusing phone books. Remember phone books? Since word on the street (and in the bar itself) is that P.J. Hanley's of Carroll Gardens is to close its doors on Sunday, March 17, it is time to drop some final knowledge on the joint and remember what we are losing. 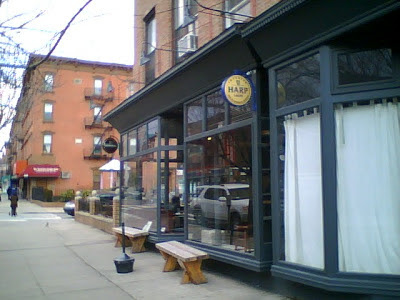 It's current Irish name notwithstanding, Hanley's is a rare local landmark that harkens back to the once-huge, local Norwegian population that inhabited South Brooklyn in the late 19th century and early 20th. It is by some accounts 139 years old, though I haven't been able to confirm this. I would submit that it is, instead, 133 years old at most, as there was, by news accounts, a grocery in this location. That grocery went out of business in 1879. The bar was founded by a Norwegian gentlemen, whose name I've never been able to discover. It went the Irish pub way in 1898 after Jack Ryan bought it. He ran it for 60 years. Ryan was from Limerick and even while he ran the bar, it still attracted a partly Norwegian clientele. Some bartenders during this period spoke passable Norwegian and would help out newly arrived immigrants for Scandinavia with introductions and such. Mr. P.J. Hanley entered the picture in 1956, and he sold it to his two nieces in the mid-90s. The place stayed open during Prohibition, keeping its windows blackened. Supposedly Al Capone met his wife here. That sounds like a tall tale to me. But Capone DID get married at the church down the street. I haven't been a huge fan of the current incarnation of Hanley's. 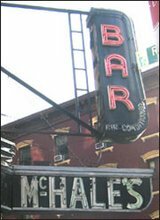 I've always felt they didn't take sufficient advantage of their heritage or make the most of the classic back bar and interior. But I hate to see it close. I hope someone else will take up the torch. For almost as many years as I've been writing this blog (seven and counting), I've been obsessively tracking the history of Cafiero's, a locally legendary Italian restaurant on President Street between Hicks and Columbia Streets. Once the haunt of judges, lawyers, mobsters and celebrities (including, Arthur Miller, Joe DiMaggio and Marilyn Monroe), it shut down in the 1970s when the owner, Sharkey Cafiero, decided it was time to retire. Sharkey remained in the house and would sometimes teasingly sit outside the restaurant, but steadfastly refused to sell the business or let anyone else take it over. (He had no children.) The building is still standing today, owned by artists who ripped out every trace of the restaurant save the bathroom. Over the years, I've accrued quite a bit of information about Cafiero's. Some it is was gathered from locals who had memories to share; some from readers who had been to the place, or whose parents had. But the best information came from actual descendants of the Cafiero clan (various siblings and in-laws worked in the restaurant), who related memories or the clientele, the menu, the staff, and sometimes sent along photos. All of these photos were either of Sharkey and his wife, or of the exterior of the restaurant. But the Holy Grail for me (aside from a menu card, which I'm pretty sure doesn't exist; it wasn't a menu kind of place) was a picture of the interior. I figured I'd never find one, because it was a private joint; mobsters don't like to get their picture taken. 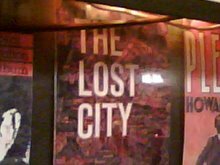 Lost City Asks, "Who Goes to Le Périgord?" 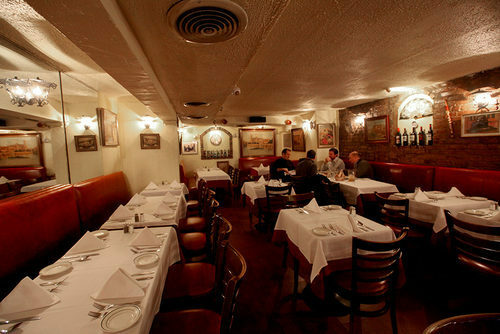 Little did I imagine the love that abides out there for the dusty French midtown mainstay Le Périgord. The comments on this particular "Who Goes There?" Eater column keep coming. (Mimi Sheraton: Whenever you comment on one of my WGT columns, my heart goes all a-flutter.) It's heartwarming that people appreciate such a time capsule. Long may it keep its silent vigil on E. 52nd Street. Something about the padded, sequestered interior of Le Périgord, the French haute cuisine holdout on east-east-east 52nd Street, turns people into librarians. Nobody at a typical lunch shift at this nearly 50-year-old restaurant talked much above a whisper. And yet the air—which smelled vaguely of your grandmother's living room—is so still (no music inside, no traffic outside) you could clearly hear conversations a few tables away. "You go to this restaurant to feel like a human being," said a man to his friend. I pegged the speaker being in his late 50s, but later realized that he was a well-preserved septuagenarian. No one in the room, waiter or patron, was under 40. When a pair a twentysomethings came in later, they were so befuddled by the unfamiliar scene of relaxed gentility that they seated themselves, thinking that was OK. The maître d' soon resituated them. Le Périgord is still owned by Georges Briguet, who bought the place from the original owner two years after the restaurant opened. Without too much mental effort, one can guess the sort of celebrity that came here once upon a time. Truman Capote, Henry Kissinger, Jackie Kennedy, etc. Plus, a regular salting of nearby UN officials. And, of course, your run-of-the-mill, blue-suited moneybags who thinks Kissinger wasn't so bad, and Capote was mean to write that stuff about Babe Paley in Answered Prayers. My relatively talkative neighbor was certainly a regular—so regular that he asked whether a favored lamb dish that wasn't on the menu was available. It was. "Well, why don't you put it on the damn menu then?" he muttered as the waiter walked away. (Just because the customers look polished doesn't mean they are. My friend dropped an F bomb every other sentence, and talked with great relish about past trysts.) "I have some friends coming into town and they asked for restaurant recommendations," he told his more docile friend. "I thought of sending them here, but thought they might think it too dull. So I told them to go to Le Grenouille." I took my neighbor's tip and ordered the wonderful Le Buffet Froid—a delicious selection of chilled asparagus, celery, cheese, pâté, cornichons, shrimp, tomato and other tidbits. Almost a meal in itself, it was sublimely satisfying. I followed that with Sole Meunière, grilled with a mustard sauce. Hey, if I'm in a place like this, I'm going to order a dish like that. It was worth the $45 just to watch the waiter expertly bone the fish tableside. Where does that happen anymore in Manhattan? Plus, the fillet was delectable; the veggies perfectly steamed. There was a dessert trolley—of course there was!—but I passed. The espresso was expert. My neighbor had moved on to the topic of money. Actually, he seldom left it. Most conversations at Le Périgord are about money or old times. The two men reminisced about sitting on stoops in Brooklyn back in the days when they had no scratch. Recently, the guy's house was reappraised at a value of $4 million. He seemed to be in the art game. "25 years ago, I could have told anybody I knew how to get rich. You buy a Hopper etching for $500. Today, it would be worth $150,000." He laughed. "Why didn't I do that, and make myself rich?" His friend paused briefly over his pâté. "But, you did," he replied. 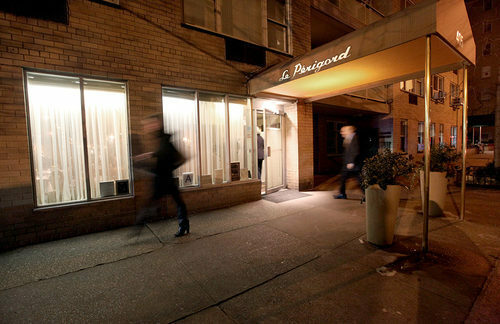 Labels: Le Perigord, midtown, who goes there?